Serve up some salmon for supper with this Baked Salmon with Black Olive Salsa. It's an escape from the everyday and is a better-for-you one-pan salmon entrée. Preheat oven to 400°F. Place salmon, skin side down, on foil-covered baking sheet. Combine remaining ingredients; spoon over salmon. Bake 18 to 20 minutes or until salmon flakes easily with fork. 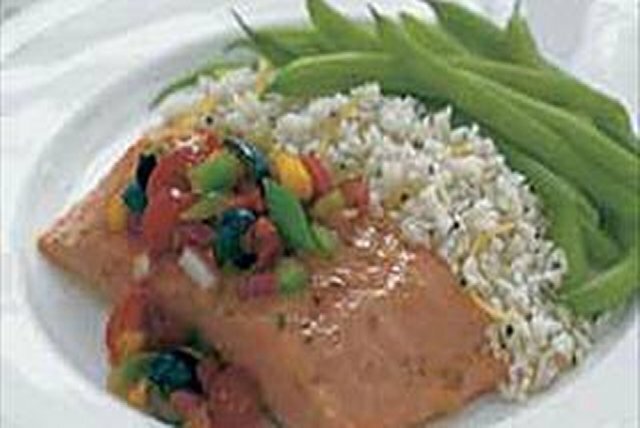 Prepare with wild salmon instead of farmed and save 35 calories and 6 g fat. Try our Lemon-Pepper Rice recipe to accompany this salmon.